Integration into a clinical workflow is only way to provide value and this app doesn’t offer that yet but many are hopeful Apple can do it. Both are well-reasoned responses, of course. Tech players do have a tendency to change the status quo; they also conduct a crazy number of pilots, which adds to their institutional experience but doesn’t change much in the end. Apple is the latest tech player jumping into healthcare. They bring with them hopes of empowering the consumer, by providing them access to more of their health record. You can read about it from any of a number of sources, but let’s explore the fundamentals of this announcement. Apple will use the FHIR specification to move data from the EHR to your phone. They will start with allergies, medications, conditions, immunizations, and lab results. 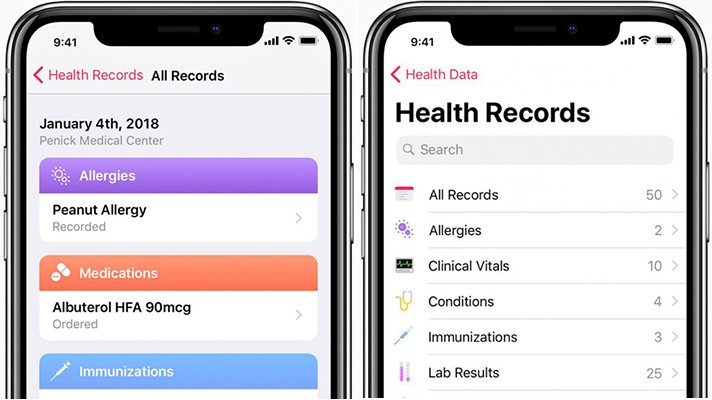 This extension of iOS will support notifications from participating health systems when data is updated in their EHR. The data will be encrypted and utilize the normal Apple mechanisms for access. There are a number of reasons that this move could have huge impacts across the healthcare space. Platforms, or ecosystems, usually precede big movements in an industry. iTunes launched Apple’s resurgence, a platform for music and eventually movies, games, and other things. Airbnb, Uber, Google, and others enable new models for age-old services. This might be the start of such a movement. If Apple is able to grab enough clean and relevant data and place it into their ecosystem, you could see a plethora of new and innovative applications emerge. Apple already has an app store, APIs, SDKs, tools, and education around their platform. EHR vendors are new to this platform game and will never have the reach that Apple has. The potential for creating new models is great. Internal IT teams have been building, or buying, mediocre patient portals for a while now. Let’s hope that Apple can make it easier for health system staff to focus on the user experience. In turn, they can spend less time trying to get the data right. I’ve argued for years that the patient is the only constant at the point of care. I may see a doctor in my home state or I may see a doctor while I’m on the road in another state; either way, I am the constant. If I had a way to direct and control my patient record in support of my own care, that would be a significant improvement in experience and potential outcome. I believe that a truly portable health record and cost transparency have the greatest potential as agents of change in healthcare. This announcement is a foundation for portability. The timing may be right for this announcement, as well. The combination of operational cost pressures on IT and the changing consumer buying patterns for healthcare have solidified the need for more cost-effective, consumer-friendly applications to serve our communities. If Apple is able to provide an easier path to a high-quality solution, they will find a receptive audience. Of course, no list is complete without stating the obvious: this is Apple. The only announcement which could have garnered more coverage would have been a Tesla play in healthcare. Apple has the brand cache, an install base of over 1B iPhones, and around $270B in cash reserves to make something happen. This will trigger meetings in Madison and Kansas City. Conversely, there are a number of reasons why this announcement might not lead to much at all. This is not an EHR, nor is it a precursor to Apple getting jumping into the EHR market. Those who think this is going to solve usability challenges in the EHR are not looking at this correctly. This move is clearly aimed at the consumer. All but the most innovative physicians will likely look at this with a healthy dose of skepticism. The hype will only make this problem worse. There is great potential here but it wasn’t designed to solve every problem facing the EHR. The EHR vendor has no incentive or pressing need to open up the data to outside vendors… and that includes Apple. This is a dangerous position for the EHR vendors to take, but still, one they have taken in the past and one they will likely continue to take. Yes, they are open platforms by their definition of “open.” EHR providers hold a lot of the cards and the data is a significant part of their value. Don’t expect them to give it up easily. I’m afraid that Apple will take too long between the release of this solution and the next. They may not be ambitious enough in their plans. A few well-placed moves and they could become the defacto platform for getting information to the emerging consumer patient. If they move too slowly, I’m afraid we will put this announcement on the stack of stories of how tech companies can’t figure out healthcare. Finally, many applications require integration back into the clinical workflow, in order to provide value. This challenge can only be solved with deep integration into the EHR, which this solution doesn’t offer in its first iteration. It may get there over time, but it doesn’t offer that today. This can lead to unmet expectations and an overblown hype cycle, as I mentioned in the first point of this section. I’ve already written about this in a previous article, entitled From a CIO: What Should Be Apple’s Next Big Healthcare Move? I’ll give you the punchline here: Digitize the intake process. Make it easy to collect basic questions from the patient with a mechanism similar to Apple Pay. Then, take it a step further and provide a way to send a basic set of questions to the patient around their procedure, storing that for easy sharing during their care journey. With their market penetration, Apple is well-positioned to be a conduit for the consumer as they journey between disparate systems and the disconnected islands of information that, unfortunately, are a hallmark of healthcare. Put me in the category of a hopeful optimist on this announcement. Bill Russell is the CEO of Health Lyrics.